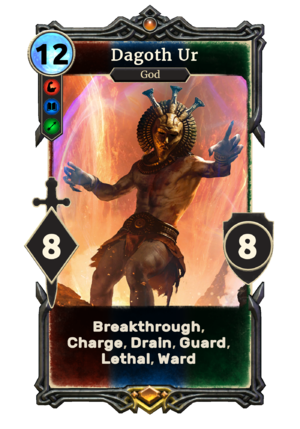 Dagoth Ur is a unique legendary House Dagoth creature card. It is part of the Houses of Morrowind expansion. In addition to the card's availability in the Houses of Morrowind expansion, one copy is included in the Dagoth's Might theme deck. "Come to me! Through fire and war, I welcome you." "Have you any parting words?" Dagoth Ur first appeared in Morrowind. This page was last modified on 31 March 2019, at 13:14.